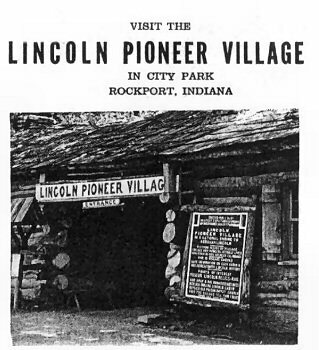 Designed by George Honig, artist and sculptor, under direction of the Spencer County Historical Society and Rockport Park Board, the Lincoln Pioneer Village was constructed during the period from 1935 to 1937. This memorial to Abraham Lincoln's 14 formative years (1816 - 1830) spent in Spencer County consists primarily of structures and other artifacts which represent the life and times of Lincoln, his pioneer neighbors and friends. Rockport, largest city and county seat of Spencer County since 1818, is bounded on the east by the Ohio River. The city is situated approximately 25 miles east of Evansville, Indiana, and 11 miles north of Owensboro, Kentucky, at the junction of Indiana State Highways 45 and 66 (The Lincoln Heritage Trail). The Village which is adjacent to the Rockport City Park takes unique advantage of some of the most beautiful wooded area in this region. 1 and 2. Administration building and souvenir room. Many articles, not all of the Lincoln period, are displayed here. 3. John Pitcher's law office. Pitcher was the first resident lawyer in Spencer County and became Rockport's first City Attorney in 1818. He became interested in young Abe Lincoln, and lent him books to read. The Lincoln home was 17 miles north of Rockport and Abe often walked that distance to borrow or return a book. In this office notice the desk, law books, and bellows for fanning the fire. 7. Old Pigeon Baptist Church. This is a replica of the structure which Thomas Lincoln and his son Abraham helped build. 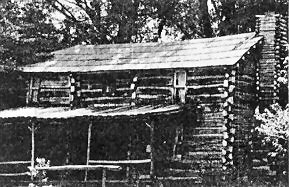 The Lincoln family attended Old Pigeon while living in Spencer County. All members of the family, except Abe, belonged to this church. The stairway in this building leads to a loft. The loft was used as sleeping quarters by the men who brought their families from such distant points that they were compelled to stay overnight. The women and children stayed among the neighbors. An old fashioned flower garden lies near the church. 10. Pioneer schoolhouse. In a building quite similar to this, with dirt floor and puncheon benches, young Lincoln attended school in Spencer County. A bucket and gourd dipper are located by a window. 11. Aunt Lepha McKay (or Mackey) home. Aunt Lepha was a beloved Rockport lady who took colored children into her home and taught them to read and write long before there were schools for colored people. She once owned the land on which the Lincoln Pioneer Village is located. 12. Museum of early transportation. This structure was erected by the production crew of the movie "The Kentuckian" and depicts an early tobacca warehouse. Several buggies, a hearse, and other horsedrawn vehicles may be seen here. 15. Grandview Block House. 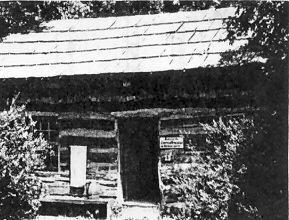 This fortified log house is located at the palisade on the north side of the Village and represents a building which was located near Grandview, Indiana. 16. Museum. This large, fireproof building was built in 1950 by the Rockport Park Improvement Association, Incorporated. This association which now manages the operation of the Village has displayed here several valuable exhibits of artifacts from different periods of Indiana history. 17. Market and Barter House. Pioneers brought furs, farm produce, and homemade goods to such a place to barter for things they needed. A display of wooden shoes and the tools used to make them brings to mind the German settlers of pioneer Spencer County, many of whom wore wooden shoes. 19. The wishing well, covered wagon, oxcart, sweep and windlass wells, mill burrs, shaving horse, ash hopper, soap kettles, hitch racks, grind stones, wood mould board plow, and other pioneer items are located throughout the Village grounds. The Rockport City Park affords excellent free facilities for picnicking: good water, tables and benches, and open air furnaces. Shelter house facilities may be obtained for a nominal fee by contacting the park custodian for reservations. The admission charge for a leisurely visit to Lincoln Pioneer Village is $.25 for children and $.50 for adults. Open daily from 8 AM to 5 PM. Bring your friends and come again.